Welcome to week three of ‘Frugal Feast’, a scrumptious regular feature which I’m working on with the fantastic Eva from Girl Counting Pennies! Our Frugal Feast feature is a collection of frugal recipes designed for people on a tight budget like us. Eva and I are both working very hard to save money in order to pay off our debts faster and grocery shopping is one area where we have both cut back significantly. Our aim is to provide recipes for meals which are cheap to make without compromising on deliciousness! Hello everyone! I am Eva and I am working on our Frugal Feast feature with Hayley. I hope you have enjoyed our recipes so far! Today I thought I would share my quick and easy vegetable stir fry recipe which I normally make when I am short for time. This past weekend has been rather busy and as a result, I decided to make something quick and simple for dinner on Sunday, and my vegetable stir fry was exactly that! Not only has this recipe saved me time, it also turned out to be super delicious… and cheap to make, of course! Enjoy! I have used frozen vegetables this time around since my sister had them in the freezer for ages, but I normally use fresh ones whenever I make a vegetable stir fry (I add onions, carrots, shiitake mushrooms, baby corn, broccoli and shredded cabbage to the mix). The above ingredients make two adult portions at 58p per portion. You will need one small saucepan, a wok (or a large frying pan), a wooden spoon to stir, a bowl (or a cup), one tablespoon and one teaspoon. Naturally, you will need a knife to chop your vegetables if using fresh ones. Prepare your stir fry sauce by mixing coconut milk, soy sauce, lemon juice, brown sugar and salt/chilli powder together in a bowl or a cup. Warm a wok or a large frying pan over medium heat. Add the oil and your vegetables. If you are using a frozen vegetable mix, add all vegetables at once and simmer over medium heat stirring occasionally for about 5 minutes. If you are using fresh vegetables, add diced onion and thinly chopped carrots first. Stir fry for 2-3 minutes and then add the rest of your vegetables (shiitake mushrooms, baby corn, broccoli and shredded cabbage). Mix all your vegetables together and stir fry for another 2 minutes. Cook noodles according to package instructions in a small saucepan, which is normally 8-12 minutes. Once ready, drain them thoroughly. 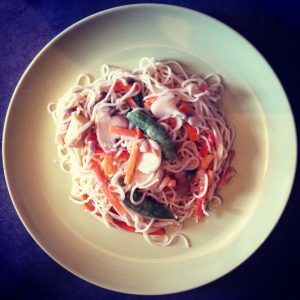 Add your noodle to your vegetables and stir them together. Now add your sauce and stir some more on medium heat. Simmer for about 5 minutes. Taste test and if you think something is missing add to taste! Serve hot and enjoy! Author Bio: Eva is a personal finance writer and blogger living in London, United Kingdom. She is currently documenting her journey to debt freedom over at her blog Girl Counting Pennies. You can also find her on Twitter. If you’d like to be kept updated with future posts, please consider subscribing by email or RSS to make sure you don’t miss them! My list of free or cheap things to do! Oh, that sounds awesome. I love that you’re making the sauce from basic ingredients…I haven’t tried doing that from ‘scratch’ before. Cooking Asian meals is something I’ve always wanted to try but haven’t yet. I’ll have to give it a go! I love stir fries, lots of vegetables and so easy to put together! Sounds delicious, Eva! I love stir-frys since they are so adaptable to your tastes or what you have available. 🙂 And easy to make which this Mom appreciates after a busy day at work! Yum, that sounds super good and easy! I’d probably have to add meat since B’s a huge carnivore, but all the other ingredients are probably already in my kitchen. Thanks for sharing, Eva! I have to try this at some point because of the coconut milk used. It must taste so delightful and yet, it looks so simple to make that there;s no excuse for em to not make it! Easy to prepare, nutritious and looks pretty delicious. And all that while not denting the pocket! Something I should definitely try.